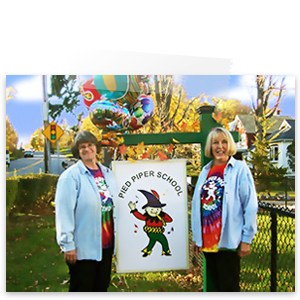 Pied Piper Fall Collection CD now available for purchase! Kathy & Marsha have completed their third CD in 34 years. Our Fall and Halloween/Thanksgiving collections are available at the school for $10.00 each or 2 for $15.00. The CD features songs we sing in Sept.,Oct. & Nov. Parents have always asked us for the words to the songs we sing and school. Our songs are all Kathy originials, so the CD will help you with the melodies as well as the words. We are planning a series of 6 CD’s to cover our school year, so stay posted for the release of Winter Wonderland favorites. Pick up a copy at school or call us at 962-5196 and we will ship to you.